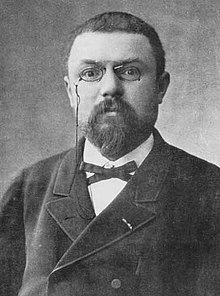 Jules Henri Poincaré (29 April 1854 – 17 July 1912), generally known as Henri Poincaré, was one of France's greatest mathematicians and theoretical physicists, and a philosopher of science. Le savant digne de ce nom, le géomètre surtout, éprouve en face de son œuvre la même impression que l'artiste ; sa jouissance est aussi grande et de même nature. A scientist worthy of the name, above all a mathematician, experiences in his work the same impression as an artist; his pleasure is as great and of the same nature. ...we work not only to obtain the positive results which, according to the profane, constitute our one and only affection, as to experience this esthetic emotion and to convey it to others who are capable of experiencing it. C'est même des hypothèses simples qu'il faut le plus se défier, parce que ce sont celles qui ont le plus de chances de passer inaperçues. It is the simple hypotheses of which one must be most wary; because these are the ones that have the most chances of passing unnoticed. The task of the educator is to make the child's spirit pass again where its forefathers have gone, moving rapidly through certain stages but suppressing none of them. In this regard, the history of science must be our guide. Everyone is sure of this [that errors are normally distributed], Mr. Lippman told me one day, since the experimentalists believe that it is a mathematical theorem, and the mathematicians that it is an experimentally determined fact. Thought must never submit, neither to a dogma, nor to a party, nor to a passion, nor to an interest, nor to a preconceived idea, nor to whatever it may be, save to the facts themselves, because, for thought, submission would mean ceasing to be. There is no science apart from the general. It may even be said that the very object of the exact sciences is to spare us these direct verifications. We can not... escape the conclusion that the rule of reasoning by recurrence is irreducible to the principle of contradiction. ...Neither can this rule come to us from experience... This rule, inaccessible to analytic demonstration and to experience, is the veritable type of the synthetic a priori judgment. On the other hand, we can not think of seeing in it a convention, as in some of the postulates of geometry. ...it is only the affirmation of the power of the mind which knows itself capable of conceiving the indefinite repetition of the same act when once this act is possible. The mind has a direct intuition of this power, and experience can only give occasion for using it and thereby becoming conscious of it. But, one will say, if raw experience can not legitimatize reasoning by recurrence, is it so of experiment aided by induction? We see successively that a theorem is true of the number 1, of the number 2, of the number 3 and so on; the law is evident, we say, and it has the same warranty as every physical law based on observations, whose number is very great but limited. But there is an essential difference. Induction applied to the physical sciences is always uncertain, because it rests on the belief in a general order of the universe, an order outside of us. Mathematical induction, that is, demonstration by recurrence, on the contrary, imposes itself necessarily, because it is only the affirmation of a property of the mind itself. Les mathématiciens n'étudient pas des objets, mais des relations entre les objets ; il leur est donc indifférent de remplacer ces objets par d'autres, pourvu que les relations ne changent pas. La matière ne leur importe pas, la forme seule les intéresse. We see that experience plays an indispensable role in the genesis of geometry; but it would be an error thence to conclude that geometry is, even in part, an experimental science. If it were experimental it would be only approximative and provisional. And what rough approximation! ...The object of geometry is the study of a particular 'group'; but the general group concept pre-exists... in our minds. It is imposed on us, not as form of our sense, but as form of our understanding. Only, from among all the possible groups, that must be chosen... will be... the standard to which we shall refer natural phenomena. Experience guides us in this choice without forcing it upon us; it tells us not which is the truest geometry, but which is the most convenient. Notice that I have been able to describe the fantastic worlds... imagined without ceasing to employ the language of ordinary geometry. Is the position tenable, that certain phenomena, possible in Euclidean space, would be impossible in non-Euclidean space, so that experience, in establishing these phenomena, would directly contradict the non-Euclidean hypothesis? For my part I think no such question can be put. To my mind it is precisely equivalent to the following, whose absurdity is patent to all eyes: are there lengths expressible in meters and centimeters, but which can not be measured in fathoms, feet, and inches, so that experience, in ascertaining the existence of these lengths, would directly contradict the hypothesis that there are fathoms divided into six feet? What is mass? According to Newton, it is the product of the volume by the density. According to Thomson and Tait, it would be better to say that density is the quotient of the mass by the volume. What is force? It, is replies Lagrange, that which moves or tends to move a body. It is, Kirchhoff will say, the product of the mass by the acceleration. But then, why not say the mass is the quotient of the force by the acceleration? When we say force is the cause of motion, we talk metaphysics, and this definition, if one were content with it, would be absolutely sterile. For a definition to be of any use, it must teach us to measure force; moreover that suffices; it is not at all necessary that it teach us what force is in itself, nor whether it is the cause or the effect of motion. We must therefore first define the equality of two forces. When shall we say two forces are equal? It is, we are told, when, applied to the same mass, they impress upon it the same acceleration, or when, opposed directly one to the other, they produce equilibrium. This definition is only a sham. A force applied to a body can not be uncoupled to hook it up to another body, as one uncouples a locomotive to attach it to another train. It is therefore impossible to know what acceleration such a force, applied to such a body, would impress upon such an other body, if it were applied to it. It is impossible to know how two forces which are not directly opposed would act, if they were directly opposed. We are... obliged in the definition of the equality of the two forces to bring in the principle of the equality of action and reaction; on this account, this principle must no longer be regarded as an experimental law, but as a definition. ... treatises on mechanics do not clearly distinguish between what is experiment, what is mathematical reasoning, what is convention, and what is hypothesis. If we study the history of science we see happen two inverse phenomena... Sometimes simplicity hides under complex appearances; sometimes it is the simplicity which is apparent, and which disguises extremely complicated realities. ...No doubt, if our means of investigation should become more and more penetrating, we should discover the simple under the complex, then the complex under the simple, then again the simple under the complex, and so on, without our being able to foresee what will be the last term. We must stop somewhere, and that science may be possible, we must stop when we have found simplicity. This is the only ground on which we can rear the edifice of our generalizations. It is often said that experiments should be made without preconceived ideas. That is impossible. Not only would it make every experiment fruitless, but even if we wished to do so, it could not be done. Every man has his own conception of the world, and this he cannot so easily lay aside. We must, for example, use language, and our language is necessarily steeped in preconceived ideas. Si donc un phénomène comporte une explication mécanique complète, il en comportera une infinité d’autres qui rendront également bien compte de toutes les particularités révélées par l’expérience. If, then, a phenomenon admits of a complete mechanical explanation, it will admit of an infinity of others, that will render an account equally well of all the particulars revealed by experiment. If all the parts of the universe are interchained in a certain measure, any one phenomenon will not be the effect of a single cause, but the resultant of causes infinitely numerous; it is, one often says, the consequence of the state of the universe the moment before. Time and Space … It is not nature which imposes them upon us, it is we who impose them upon nature because we find them convenient. The advance of science is not comparable to the changes of a city, where old edifices are pitilessly torn down to give place to new, but to the continuous evolution of zoologic types which develop ceaselessly and end by becoming unrecognizable to the common sight, but where an expert eye finds always traces of the prior work of the centuries past. One must not think then that the old-fashioned theories have been sterile or vain. Cette harmonie que l’intelligence humaine croit découvrir dans la nature, existe-t-elle en dehors de cette intelligence ? Non, sans doute, une réalité complètement indépendante de l’esprit qui la conçoit, la voit ou la sent, c’est une impossibilité. For an aggregate of sensations to have become a remembrance capable of classification in time, it must have ceased to be actual, we must have lost the sense of its infinite complexity, otherwise it would have remained present. It must, so to speak, have crystallized around a center of associations of ideas which will be a sort of label. It is only when they have lost all life that we can classify our memories in time as a botanist arranges dried flowers in his herbarium. Si toutes les parties de l’univers sont solidaires dans une certaine mesure, un phénomène quelconque ne sera pas l’effet d’une cause unique, mais la résultante de causes infiniment nombreuses ; il est, dit-on souvent, la conséquence de l’état de l’univers un instant auparavant. We have not a direct intuition of simultaneity, nor of the equality of two durations. If we think we have this intuition, this is an illusion. We replace it by the aid of certain rules which we apply almost always without taking count of them. ...We ...choose these rules, not because they are true, but because they are the most convenient, and we may recapitulate them as follows: "The simultaneity of two events, or the order of their succession, the equality of two durations, are to be so defined that the enunciation of the natural laws may be as simple as possible. In other words, all these rules, all these definitions, are only the fruit of an unconscious opportunism." Mathematics have a triple aim. They must furnish an instrument for the study of nature. But that is not all: they have a philosophic aim and, I dare maintain, an esthetic aim. They must aid the philosopher to fathom the notions of number, of space, of time. And above all, their adepts find therein delights analogous to those given by painting and music. They admire the delicate harmony of numbers and forms; they marvel when a new discovery opens to them an unexpected perspective; and has not the joy they thus feel the esthetic character, even though the senses take no part therein? Only a privileged few are called to enjoy it fully, it is true, but is not this the case for all the noblest arts? This is why I do not hesitate to say that mathematics deserve to be cultivated for their own sake, and the theories inapplicable to physics as well as the others. Even if the physical aim and the esthetic aim were not united, we ought not to sacrifice either. ...the analyst, who pursues a purely esthetic aim, helps create, just by that, a language more fit to satisfy the physicist. In a word, to get the law from experiment, it is necessary to generalize... But how generalize? ...in this choice what shall guide us? It can only be analogy. ...What has taught us to know the true profound analogies, those the eyes do not see but reason divines? It is the mathematical spirit, which disdains matter to cling only to pure form. As we can not give a general definition of energy, the principle of the conservation of energy signifies simply that there is something which remains constant. Ch. 10: Is Science artificial? What is objective must be common to many minds and consequently transmissible from one to the other, and as this transmission can only come about by... discourse... we are even forced to conclude: no discourse no objectivity. Now what is science? ...it is before all a classification, a manner of bringing together facts which appearances separate, though they are bound together by some natural and hidden kinship. Science, in other words, is a system of relations. ...it is in relations alone that objectivity must be sought. ...it is relations alone which can be regarded as objective. All that is not thought is pure nothingness; since we can think only thought and all the words we use to speak of things can express only thoughts, to say there is something other than thought, is therefore an affirmation which can have no meaning. And yet—strange contradiction for those who believe in time—geologic history shows us that life is only a short episode between two eternities of death, and that, even in this episode, conscious thought has lasted and will last only a moment. Thought is only a gleam in the midst of a long night. But it is this gleam which is everything. The page numbers below refer to the Francis Maitland translation text, not the original French text. La sociologie est la science qui possède le plus de méthodes et le moins de résultats. Le savant n'étudie pas la nature parce que cela est utile; il l'étudie parce qu'il y prend plaisir et il y prend plaisir parce qu'elle est belle. Si la nature n'était pas belle, elle ne vaudrait pas la peine d'être connue, la vie ne vaudrait pas la peine d'être vécue. Je ne parle pas ici, bien entendu, de cette beauté qui frappe les sens, de la beauté des qualités et des apparences; non que j'en fasse fi, loin de là, mais elle n'a rien à faire avec la science; je veux parler de cette beauté plus intime qui vient de l'ordre harmonieux des parties, et qu'une intelligence pure peut saisir. The principal aim of mathematical education is to develop certain faculties of the mind, and among these intuition is not the least precious. It is through it that the mathematical world remains in touch with the real world, and even if pure mathematics could do without it, we should still have to have recourse to it to fill up the gulf that separates the symbol from reality. Variant translation: The chief aim of mathematics teaching is to develop certain faculties of the mind, and among these intuition is by no means the least valuable. La logique nous apprend que sur tel ou tel chemin nous sommes sûrs de ne pas rencontrer d'obstacle ; elle ne nous dit pas quel est celui qui mène au but. Pour cela il faut voir le but de loin, et la faculté qui nous apprend à voir, c'est l'intuition. Sans elle, le géomètre serait comme un écrivain qui serait ferré sur la grammaire, mais qui n'aurait pas d'idées. Every definition implies an axiom, since it asserts the existence of the object defined. The definition then will not be justified, from the purely logical point of view, until we have proved that it involves no contradiction either in its terms or with the truths previously admitted. Pure mathematicians... more than all others, have been led to realise how cautious we must be of the dictates of intuition and so-called common sense. They know that the fact that we can conceive or imagine a certain thing only in a certain way is no criterion of the correctness of our judgement. Examples in mathematics abound. ...Mathematicians, as a whole, refused to question the soundness of Einstein's theory on the sole plea that it conflicted with our traditional intuitional concepts of space and time, and we need not be surprised to find Poincaré... lending full support to Einstein when the theory was so bitterly assailed in its earlier days. 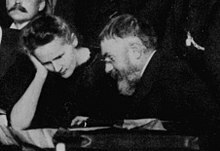 Poincaré has justly emphasized the fact that we distinguish two kinds of alterations of the bodily object, "changes of state" and "changes of position." The latter, he remarked, are alterations which we can reverse by arbitrary motions of our bodies. With the disappearance of the great French mathematician has disappeared the one man whose thought could carry all other thoughts, the one mind who, through a sort of rediscovery, could penetrate to its very depth all the knowledge which the mind of man can comprehend. And that is why the demise of this man at the peak of his intellectual strength is such a disaster. Discoveries will lag, groping efforts will be drawn out; for, the potent luminous brain will not be there to coordinate disjointed research, or to cast the daring plummet of a new theory into a world of obscure facts suddenly revealed by experience. Ernst Hölder attributed this to Poincaré in 1924: "Poincaré at the Rome Congress (1908) went so far as to say …", but this is not an accurate summary of his remarks in "The Future of Mathematics". See Jeremy Gray, "Did Poincaré say ‘Set theory is a disease’? ", The Mathematical Intelligencer, 13:19-22. Also, probably a variant translation of Hölder's comment, "Point set topology is a disease from which the human race will soon recover." This page was last edited on 3 November 2018, at 22:46.